Fundraising with the Water Buffalos!!! Because of your continued support towards Ride with Purpose, the Water Buffalos, we wanted to again invite you to collaborate in a fundraising event with us. Last year, Ride with Purpose donated $80,000 to Water For People and $20,000 to Community Engineering Corps. Because our organization supports both, please feel free to use this fundraiser as a way to add to or establish a way for your section to also donate to one or both of these organizations with the proceeds raised on behalf of your section. 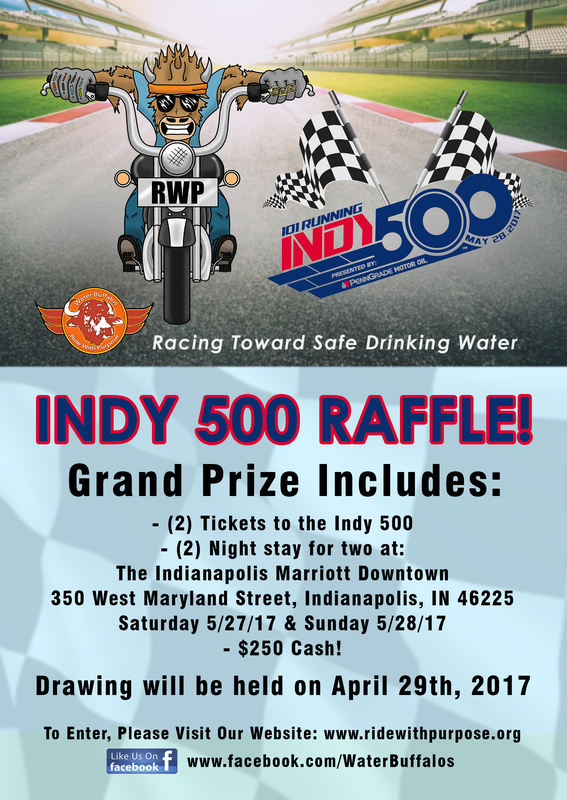 Last year’s Section leader for funds raised with the Water Buffalos, in our Victory Motorcycle Raffle, was the Illinois Section, earning $400 for sharing and promoting that raffle. We ask that your section distribute this flyer attached and link above to your members and promote this event. Please inform the recipients that for each person that purchases tickets and resides in the state or states that your section represents, your Section will receive 50% of the profit for those tickets sold. 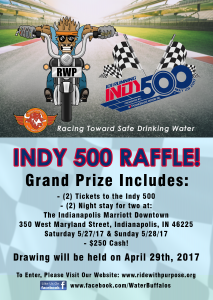 Encourage your membership to share this event with others, even if they are not in the industry, the Indy 500 is for everyone!!!! If you have any questions, please email me at membership.rwp@gmail.com. To participate, please respond back to this email that you wish to be included so that we properly document which Sections we will be collaborating with. Thank you for your support in the past, if you have not yet purchased your 2017 Patch, please do so soon, so that it is worn by all water buffalos in attendance to various event over the next year.